Last year, I was driving along a moderately quiet street when I noticed police on either side of the road. I slowed down as I approached, knowing that this was a check stop for something or other. I saw them peer into my vehicle windows as I drove closer to them. They must have seen the cutie pie toddler strapped into his car seat behind me because next thing I know, I’m being ushered along into a very full parking lot stuffed with young families. After full cooperation, much joking and gratitude for their service, I’m handed a $155 fine. Yep, my son’s car seat, after all the hassle of pouring over online car seat reviews, reading the very detailed manual front to back, and painstaking assembly into my cramped car, was not fit for safety. What went wrong? Ah yes, foolish complacency (find out below). The driver of any vehicle in use in Alberta has the wonderful obligation to ensure any passenger under 16 years is seat-belted correctly. I myself am lucky enough not to have a 16 year old to negotiate with (can’t wait for that day), but I do have two preschoolers who depend on me and my judgement for safety. This means I have to ensure the correct car seats are being used, they are correctly installed, and my children are properly secured in them. These three tasks, if performed correctly, should reduce the risk of injury during an accident by as much as 71%. To ensure they are correctly installed – check the manual and ensure your child rides only in the backseat of any vehicle. No car seat is safety rated for use in the front seat. To ensure your child is properly secured – check the manual and do the two finger test between the five-point harness or seat belt and your child. 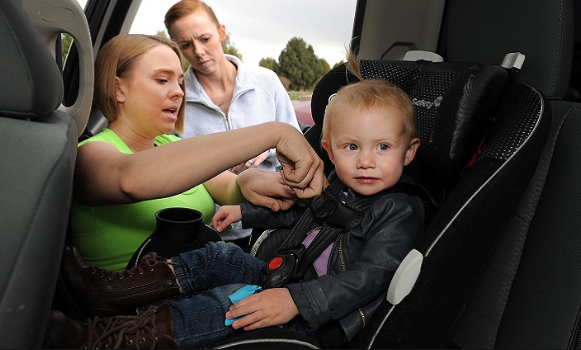 Do not bundle your child in thick clothing as this could make the seat belt ineffective. For those looking at the numbers right now, it’s important to note that Alberta is currently undergoing changes to car seat safely legislation. The changes are said to properly address safety by assessing a child’s height more so than their weight as height is a better indicator of being able to properly fit into a car seat. My stringbean children would agree! Therefore, I have addressed the province’s current views, which pertain to checking the manufacturer’s car seat manual. Rear-facing car seats are the safest option for any child who still fits in one. Car seat manufacturers produce seats that have seat-specific weight and height limits. The longer a child can stay rear-facing, the lower the risk of injury in an accident, so it’s best to pick one up that can stay rear-facing beyond the age of two. As a parent, I understand the dilemmas in keeping your child rear-facing. For one, children are people, have emotions, and crave being entertained and seeing a parent’s face. My children did not do well in rear-facing seats for very long. They like toys, being handed objects, interacting with me, and sharing food. For the sake of safety, I kept my children in rear-facing seats as long as possible and got by with a few well-chosen tools, namely the Lamaze Jacques the Peacock car seat hanging toy, DMoose Car Seat Travel Tray, and Brica Baby In-sight Mirror. Jacques the Peacock was hand-chosen by Grandpa. This toy has phenomenal reviews, is easy to install, and keeps munchkins entertained for roughly 20 minute car rides. But, if a short commute to the grocery store isn’t what you’re planning this weekend, I suggest the DMoose Travel Tray. This too was gifted to me, but by my brother who travels from very far to visit me with his young family. Well versed in travel tantrums, he couldn’t say enough positives about this item – it has easy to open compartments to store toys, crayons, bottles, and snacks. It also has good safety ratings, as it is stable but forgivable. Lastly, if you’re a paranoid parent (guilty) and need to watch your child and the road at the same time, pick up a backseat mirror. I started with a small version at first but quickly stepped up to the largest mirror I could find, which is my advice to you. Don’t be afraid to spend the money on this item as it will help your baby stay safe and give you piece of mind. The rear-facing car seat stage was by far the hardest for me and my boys but I had safety in mind which helped us pull through. If your child has reached the maximum weight and height limitations for the rear‑facing seat, they can move to a forward-facing seat. This normally happens around the age of two. If you have a multi-stage seat, check that your child has reached the minimum height and weight limits for the car seat (see the manufacturer’s manual), before switching to forward-facing. As with the rear-facing seats, the longer you can keep a child in a safer seat, the better, and for forward-facing, this is the five-point harness. The five-point harness allows for maximum immovability and must be used until a child reaches the maximum weight and height limit for the forward-facing seat (can move into a booster). Both of my children are currently in this stage and don’t mind it one bit. Bonus, I am still able to utilize two of my tantrum diffusing items as the DMoose Travel Tray is usable in either car seat position and the Brica Mirror worked well when strapped to the back of my headrest. Now my sons can check out our puppy riding along behind them or at their own handsome reflections. It may be that your forward-facing seat can convert into a booster seat too, but if this isn’t the case, it’s nice to know boosters are the least expensive car seats. Children who have exceeded the maximum weight and height limits for a forward-facing seat (keep that manual handy) should use a booster seat as long as the seatbelt properly crosses their chest. If a regular seatbelt does not fit your child properly, you may need to look at purchasing a different forward-facing seat that can accommodate your child, a hard truth for some of the parents I ran into at the check stop parking lot. Choose a high back booster seat if your car does not have an adequate headrest for your child. Once your child has reached the maximum weight and height limitations of the booster seat, it may be time to move to riding co-captain, but be patient as I understand this is usually at age 10. For tips on choosing the correct car seat, click here. For safety reasons, buy a new car seat that is being sold in Canada. I’m not so stringent on reading books to the end or checking out early on a diet, but as a parent, I do not want to cut corners when it comes to my children’s safety. Therefore, I buy new and look for the national safety mark sticker on the bottom of any car seat I purchase. For my piece of mind, I cannot rely on previous owners to tell me the entire history of a car seat so this is always an expense I save my pocket money for. And I get to choose my own colour! From a woman who has purchased gorgeous shoes that were too small for my feet, I know regret. Choose a seat that has room to grow, or save up for that convertible seat. It will pay for itself in the end! I know they say never to give out your email but this is one of the few times it could save you! A new car seat will come with a personal information card to send to the manufacturer. This will allow them to contact you if there is a recall for the product you purchased. If you are reading this and are cringing at the memory of recycling this card, fear not! You can always check the Transport Canada website (but the onus falls on you to keep checking)! Stow any projectiles in your car. This goes for any car ride, not just ones with little passengers. Purses, coffee mugs, cuddly Chihuahuas, or any other object not strapped in can cause injury in an accident. If a car seat is in an accident, whether a child was in it or not, do not use it again. Insurance should cover the cost of the seat and help you pay for a new one. Cut the seat belts of the old seat to prevent anyone else making the mistake of using it. Try your hardest not to be like me and forget the little things. After showing the friendly officers that my child was snuggly in his seat, my heart fell when I saw that the belt that was supposed to be anchoring the seat to the latch in the trunk of my car was not tethered. Switching car seats over from one vehicle to another too often and not double checking myself made for a foolish mistake that, luckily, would only cost me $155. The police officers that patted me on the back that afternoon also told me that Edmonton offers free car seat courses that anyone is welcome to take. Not only do you get the chance to learn some things you didn’t know but attending will also waive the fine! They really were looking out for my family that day. If you have more questions or need clarification, it is recommended that you contact your car seat manufacturer (details will be in your car seat manual) or take Alberta’s Child Car Seat YES Test to do a self-check on using the correct seat (click here). If you still don’t feel up to the challenge of installing your own car seat and want expert help, you can check St. John’s Ambulance, police stations, fire departments, and hospitals for a Car Seat Tech. Not every police officer, firefighter, or nurse is a Car Seat Tech so I would recommend asking in advance. For myself, I went to a police station and St. John’s Ambulance for preparatory purposes of my newborns’ rides home, but I’m almost certain this was due to the nesting stages of each pregnancy!